Twenty-two high school seniors from 20 schools across 15 states, have been selected to represent Drum Corps International as the "All-DCI" color guard contingent of the U.S. Army All-American Marching Band. Its members will perform as part of the U.S. Army All-American Bowl on Jan. 3 in San Antonio, Texas. 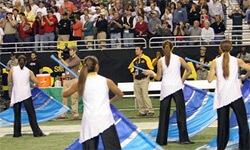 The color guard performers, who have been selected specifically based on their participation in some of DCI's most notable color guard sections, will complement the U.S. Army All-American Marching Band which recognizes the top 97 high school senior marching musicians from across the country. Together, members of this elite marching ensemble will showcase their talents during the U.S. Army All-American Bowl which is the country's premier high school football event, featuring the nation's top 90 high school football players and telecast live on NBC. "We're extremely excited to have the opportunity to partner with Drum Corps International and color guard members from the world's most elite marching music ensembles," said Brian Prato, operations manager of the U.S. Army All-American Marching Band. "Like the members of the marching band, the color guard members have been selected for their tremendous performance and leadership skills in their own band and drum corps ensembles." This group of standout color guard leaders will begin rehearsals on Dec. 29 as they "move-in" for the week to prepare for the halftime performance on Jan. 3. As part of the experience, all expenses are paid for members of the band and color guard, including transportation, hotel, food and activities. Equipment, rehearsal and reception attire as well as uniforms are provided by the partners of the U.S. Army; SportsLink, MENC, Jupiter Instruments, Inc., and DeMoulin Bros. and Co., among others. Color guard members will be instructed by staff members Tim Newburn and Ronnie Bynum. Newburn is the color guard director for the Langham Creek and Cypress Ranch High Schools in Houston, Texas, and recently joined the staff of the Blue Knights after tenures with the Glassmen, Bluecoats and Phantom Regiment. Bynum, who is a staff member with the Center Grove High School Marching Band, from Greenwood, Ind., serves as color guard caption head for the Cavaliers. This year's game will be broadcast live on NBC beginning at 1 p.m. Eastern time on Jan. 3. 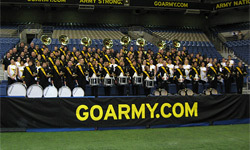 Last year – the inaugural year for the U.S. Army All-American Marching Band – the All-American Bowl set its own attendance record, with 36,534 fans in attendance. For more information on the U.S. Army All-American Marching Band, the U.S. Army All-American Bowl and its related events, visit USArmyAllAmericanBowl.com, MENC.org and GoArmy.com.